Former Premier League striker Demba Ba says he will not retire after suffering a career-threatening broken leg. 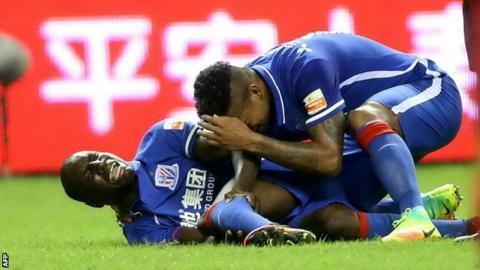 Ba, now playing for Shanghai Shenhua, collapsed during a challenge in a Chinese Super League match, with his left leg giving way beneath the knee. After the match, the Senegal forward's coach Gregorio Manzano said the injury "could end his professional career". "This is a really bad injury but I can overcome it. I won't call time on my career, that's for sure," said Ba, 31. The former West Ham, Newcastle and Chelsea forward added: "The season here ends in November and the new one starts in March. I'll do my best to return in time for the season after that." Ba, who joined Shenhua from Turkish club Besiktas for about £12m last July, is the top scorer in the Chinese Super League with 14 goals in 18 games.